You can send 1 monster from your hand or field to the GY; draw 1 card. 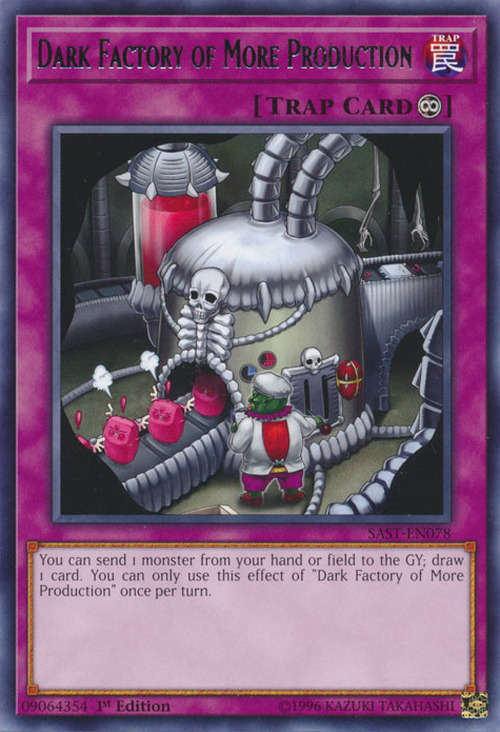 You can only use this effect of “Dark Factory of More Production” once per turn. Goblin of Greed and several Mokey Mokey appear in this card's artwork. The Mokey Mokeys going into the machine appear angry as they do in Mokey Mokey Smackdown. 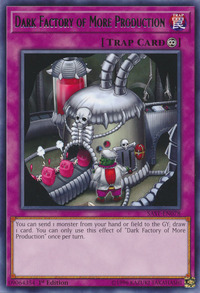 This card has a counterpart: Dark Factory of Mass Production. The Mokey Mokeys have their question/exclamation marks above their head, suggesting this takes place afterward. The Mokeys enter a machine and have the anger sapped from them, turning them into normal, motionless Mokeys on a conveyor belt identical to the one in Mass Production (which indicates the GY by its own effect) which represents the effect to send a monster to the GY for draw power. The sudden addition of draw power to the machine indicates the scene takes place after Peeking Goblin as Goblin of Greed discovers a secret Pot of Greed in the same factory. The artwork is very similar to that of Snowman Creator.